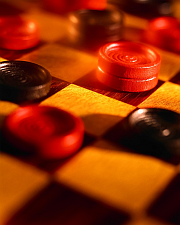 Checkers Game Terms is about the timeless board game that has found a place at gamerisms following the classic games of chess and backgammon. This article details checker game terms, rules, jumping and capturing and is followed by a description and tips about tournament play online for all skill games. Ever wonder how checkers came to be? We play this board game with friends and family and we seldom realise that the game has a long and colorful history behind it. Checkers is believed to have originated in the desert country of Egypt where it was known as Alquerque around 650 BC, though there are caves from 1400 BC that depict Alquerque like images. The game was played by philosophers and thinkers such as Plato and Homer as it provided immense mental challenge. This game closely resembles modern checkers as it features similar flat pieces with dark and light colours, a lattice based board and the aim of capturing the opponent’s pieces. The modern version is believed to have conceived in the 12th century in the south of France where it combined the basics of Alquerque on a chessboard. 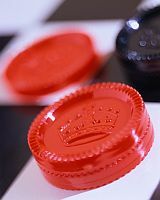 It made its way to England in the 16th century with the name of Draughts and by the late 1900, had spread to most of Europe with formalised rules, moves and procedures being extensively recorded and covered. Checkers is the common name in North America and likewise, many countries have their own localised names and rules, all variants from the original Alquerque. This board game between 2 players who rotate turns begins with a set of 12 discs of red or black. The board is divided into a grid of 64 squares, 32 black and 32 red. In the opening position, each player places their 12 pieces on the dark squares nearest to their edge of the board. The game commences with the black moving first and continues for each player in turn. A piece can only be moved diagonally on to the dark squares until it has been crowned as the king. Players capture their challenger's pieces by jumping over them diagonally to the next empty diagonal space if available. The jumped pieces are then captured and removed from the board. If you can make a jump, you have no option but to proceed, however if there are several jumps available, you select one. A player cannot jump their man/piece or the same piece twice in the same move. Additionally, a player is permitted to make multiple jumps if the pieces of the challenger are arranged in that manner. It is possible to change the direction of the jump. For example, if one piece is captured by jumping on the next diagonal, another piece may be captured by jumping in the left direction at the same time. Analyze: each move that you make to determine strategy for you and against your opponent's anticipated moves. Blockade: a position in which one player's pieces cannot move. Could signal the end of the game. Capture: the elimination of one or more opponent's pieces by jumping over them. Checkerboard: the 64-square board for this game. Jump: a move in which the second square is originally vacant and the intervening square is filled by a rival piece--thus captured. Kings: when a piece reaches the challenger’s end of the board, it is crowned as king and it can move both forward and backward diagonally only. Also, a king can jump in all four directions. As the game progresses and one of the players is unable to move either due to their pieces being captured or blocked, he or she loses. Man or Piece: term for a single checker. Pre-determined strategies: used to block your opponent’s pieces. Side pieces cannot be jumped so try to keep pieces on the sides. Centralize the kings as they make uncrowned pieces defenseless. Also, block you opponent’s pieces from becoming kings. Two for one strategy: this strategy is the forced capture trick where you play your piece in such a way that it loses itself along with two pieces of the opponent. Trap: a line of play that appears favorable on the surface but often backfires. If you like to play skill games online, the checkers game terms, rules, info and strategies following will get you in the game! There are many types of tournaments to play online. This is a brief explanation and checker game rules. Arcade tournaments are played against other players and the highest score wins the prize pot. Two types available are Instant Prize or Jackpot. Instant Prizes are awarded for the top score in a competition involving up to 10 players. Jackpot Tournaments end at a pre-set finish time. The jackpot increases for each player entry, therefore, the more players, the larger the Jackpot. After the closing time, the winner is notified and payouts are deposited to their account. 1) Try several tournament games, checkers game included, as you will find your skill level is better for specific games. Rummy may be your best game rather than mahjong. 2) If you are not a morning person, try playing late at night. Mix up your playing times and in turn, you will play against a mix of opponents. 3) Play tournaments with fewer opponents. As with any skill game, the results of tournaments are based mainly on skill, not luck. When playing skill games online and due to proprietary algorithms, the element of luck has been significantly reduced. Additionally, players are matched based on their skill levels that ensures a level playing field for online skill games. This is part 6 of 6 of the Chess Glossary + Checkers. A Checkers game is not usually as long as this Chess game. In Israel in 1980 Yedael Stepak and Yaakov Mashian were seated for a game of chess. After 24 hours and 30 minutes and 193 moves, Yedael Stepak beat Yaakov Mashian and set the record for the world's longest chess game.